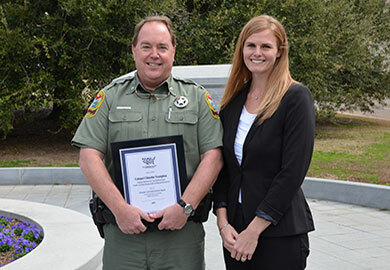 The Humane Society of the United States - South Carolina recognized S.C. Department of Natural Resources (DNR) Col. Chisolm Frampton with the Humane Law Enforcement Award at a brief ceremony on the State House grounds on Feb. 25. The award was to recognize the efforts of DNR Law Enforcement to end the practice of animal cruelty through bear baiting/baying in South Carolina. "A four-year-long investigation like this takes focused dedication from our officers, "said Col. Frampton. "And I especially want to thank the Attorney General's office in their assistance from day one. They were instrumental in making these cases." The removal and relocation of six captive bears in late 2013 was the result of a four-year-long undercover investigation by DNR Law Enforcement into bear baying/baiting in South Carolina. DNR Law Enforcement officers made in excess of 50 arrests on related charges in conjunction with the state Attorney General’s office. DNR continues to investigate illegal black bear activities such as bear baying/baiting, illegal hunting and running of bears in pens. DNR does not consider bear baying/baiting a legitimate field trial and has never issued and will not issue permits for this activity. DNR also does not consider the possession of black bears by individuals to be biologically sound, safe for the local community, or in the best long-term interest of the wild black bear resource.